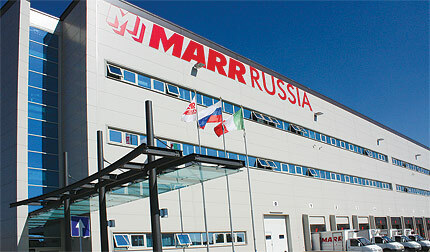 Moscow, 2 February 2010 — Inalca (Cremonini Group) has today inaugurated a new production and distribution complex in Moscow with the «MARR Russia» Brand, in the presence of the Russian Minister of Agriculture, Elena Borisovna Skrynnik, the Italian Minister for Agricultural, Food and Forestry Policies, Luca Zaia and other important local and international Authorities. The new industrial complex includes one of the largest and most modern logistical/distribution platforms in Russia for the marketing and distribution of food products and a plant for hamburger production, equipped with the most advanced technologies. Designed and coordinated by TECNO-STAR DUE , it was constructed in a strategic position in Odinzovo, in the immediate vicinity of the Moscow main ring road. The new complex covers an area of 25,000 m2 on three floors giving a total covered surface area of 26,000 m2, will provide employment for about 400 people and required an investment of 100 million Euro. The fresh (meat, cheeses, cured meats), frozen and deep-frozen (meat, fish, vegetables) and dry (pasta, oil, tomatoes preserves, etc.) foods are stored in modern warehouses at differentiated temperatures from -40°C to +3°C, with an overall capacity of over 13,000 tonnes of product. The new hamburger production department is equipped with the most advanced technologies available on the market. The production process, completely automated, has a capacity of 80,000 hamburgers per hour, corresponding to 25,000 tonnes per annum, easily increasable to 50,000 tonnes. The plant will mainly serve the McDonald’s restaurants in the Russian Federation.